Arbor Day, the annual Native Plant Sale, and Children Outdoors events are part of current Montreat Landcare Committee efforts to serve residents and visitors in our small mountain community this spring. Saturday, April 27, sees a celebration of Montreat’s status as a Tree City USA and a gathering of carefully selected vendors and guest speakers to present products and information about the use of native plants in yards and gardens and the overall stewardship of local woodlands and watersheds. Mark your calendars for this public event; details to follow on the Landcare website. 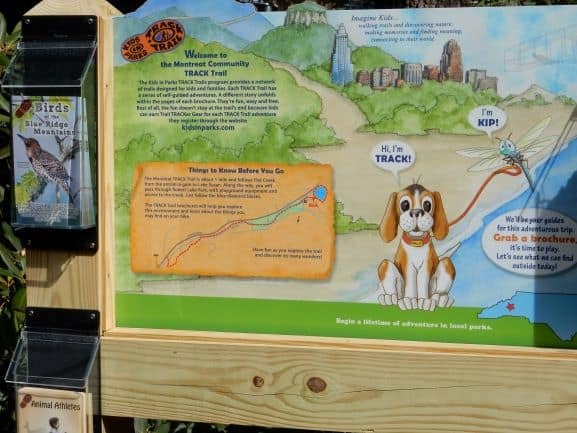 Meanwhile, the ecoEXPLORE “hotspots” of the N.C. Arboretum and the TRACK Trail kiosk and path of the Blue Ridge Parkway Foundation are in full operation, and welcome children and adults to enjoy them. See http://www.montreatlandcare.org/project/children-outdoors/. The kiosk pictured here is near Flat Creek and at the ground level of the Moore Center and shops at Lake Susan in Montreat, and makes a great place to launch your exploration of Montreat.